He ain’t afraid of no ghosts! Rapper Post Malone was recently invited to be on his favorite TV show, Travel Channel’s ghost-hunting program Ghost Adventures, which is exactly what it sounds like. 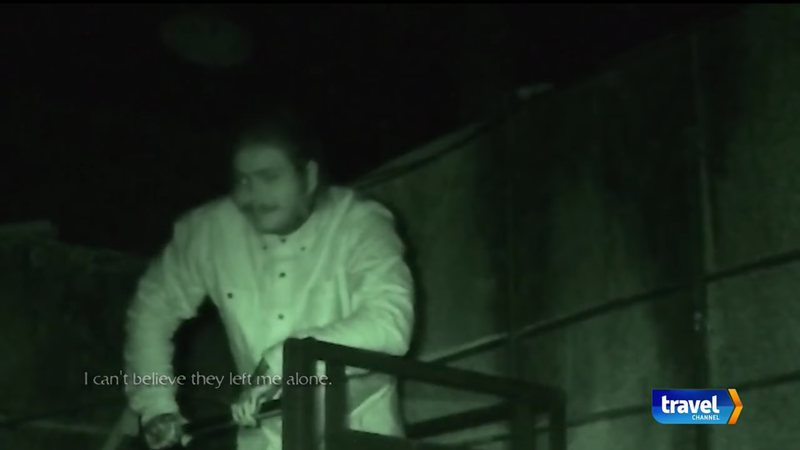 In his episode (which aired January 13), Posty either encountered some super rude ghosts, or the show’s host Zak Bagans decided to have a bit of fun with the guest-star. Post joins Bagans and his crew as they investigate The Slaughterhouse, a popular haunted house in Tucson, Arizona (it used to be an actual slaughterhouse, now it offers scary tours with spooky staff members dressing up like zombies and crazy butchers.) Several employees of the haunt told the Ghost Adventurers they’ve been scratched, bruised, touched, or otherwise “affected” by something weird (read: a ghost) hanging out around the venue. It’s unclear if Bagans and his TV pals are pranking Post Malone, or if whatever paranormal pal hanging around the ol’ slaughterhouse is doing the job. The dude is terrified regardless. In one scene, the crew holds some spooky device that pick ups ghost things, aims it at Post and starts getting feedback (from the supposed ghosts bothering them.) “Can you tell me something about this man?” someone asks. The machine reads back: DIRTY. And then another time, it reads back: AFRAID. And then again: REALLY AFRAID. Is it proof of a ghost? Probably not. Is it proof that either the ghost or the people in charge of making the show have a sense of humor? I don’t know, I can’t tell you whether ghosts are real or not—but I can tell you this made for some very watchable television. Regardless of whether the hosts orchestrated the gag or it was the supernatural commenting on Post’s demeanor, I enjoyed it.